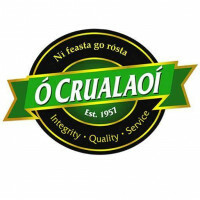 Ó Crualaoí Family Butchers was set up in 1957 by Kevin Ó Crualaoí and his wife Máire, who developed an in-depth knowledge and awareness of food production and farming techniques and a passion for exceptionally delicious food. Today, their son Micheal operates the chain of Ó Crualaoí’s local family butchers and delicatessens with stores Ballincollig, Fermoy, Wilton and Carrigaline. The teams focus is to provide excellent-tasting food with full traceability Aligned to their high standards of service, Ó Crualaoí Butchers work with our healthpro Menu Mentoring team to provide nutritional and allergen information on all products, including their popular 'Real Food for Fitness' range. Ó Crualaoí's offer low fat, low saturated fat, low salt, low sugar, and high protein options. All products are also diary-free, egg-free, gluten-free, and suitable for a coeliac-friendly diet. We are pleased to announce that Ó Crualaoí's continue to fulfil all necessary criteria for inclusion in healthpro's on-line platform for customer nutritional information provision, the Healthy Eating Guide.